Log in to add Rewards to your account. Please read these terms and conditions carefully before using your Irving Rewards Card, establishing your Irving Rewards Account, and/or using the Irving Rewards Website (www.theirving.com/rewards). Registration or use of an Irving Rewards Card, Irving Rewards Account, and/or the Irving Rewards Website confirms, by your action, your acknowledgement that you have received, understood and accepted these Participant Terms and Conditions. Irving may revise these Participant Terms and Conditions at any time by updating the “Participant Terms and Conditions” displayed on the Irving Rewards Website, which revisions will be binding upon you by your subsequent use of your Irving Rewards Card, Irving Rewards Account and/or the Irving Rewards Website. You will be responsible for keeping yourself up to date regarding these Participant Terms and Conditions. These Participant Terms and Conditions will be controlling in the event of any conflict or inconsistency with any other communications, including advertising or promotional materials. If you do not agree with these Participant Terms and Conditions, please do not use the Irving Rewards Website or participate in the Irving Rewards Program. “You,” “Your,” and “Participant” refer to the participant who registers with Irving Rewards to create an Irving Rewards Account. A Participant must be eighteen (18) years old or older. “Irving” refers to Irving Oil Marketing, Inc., the owner, sponsor and administrator of the Irving Rewards Program. “Irving Energy” means Highlands Fuel Delivery, LLC, an affiliate of Irving and provider of home heating fuels. “AE Robinson” means A. E. Robinson Oil Company, a Maine corporation, for so long as it is a third-party Earn Partner participant in the Irving Rewards Program. “Earn and Redeem Partners” means Fuel Sellers, AE Robinson and Irving Energy through which Participants may make Qualifying Purchases to earn Irving Reward Discounts and/or redeem or expend Discounts subject to the terms of the Irving Rewards Program. “Irving Rewards Account” is an electronic record maintained and administered by Irving for you upon your registration with Irving Rewards reflecting your participation in the Irving Rewards Program, the Discounts you have earned in the Irving Rewards Program, and the Discounts you have redeemed or expended through Fuel purchases. Your Irving Rewards Account balance will be shown in your Account Summary, found on the theirving.com/rewards Website (the “Account Summary”). Your Irving Rewards Account is not transferable and may not be sold, combined with, or shared with another person or account. Irving reserves the right to suspend or terminate your Irving Rewards Account if you violate these Participant Terms and Conditions, misrepresent or falsify material information, or take any other action that Irving in its discretion determines is detrimental to the Irving Rewards Program. “Irving Rewards Card” is the card designated and issued by Irving for use in the Irving Rewards Program, linked to your Irving Rewards Account after registration in the Irving Rewards Program, and to be used by you in making certain Qualifying Purchases to earn Discounts under the Irving Rewards Program. “Irving Rewards Program” is a motor fuel discount program that lets you obtain discounts (“Discounts”) off the price per gallon of Irving motor fuels (“Fuel”) purchased from participating Irving-branded retail motor fuel dealers (“Fuel Sellers”). The Irving Rewards Program is not a credit card, gift card, or stored value card program of any kind. Irving records the Discounts earned on your Qualifying Purchases and also records Discounts redeemed or expended through Fuel purchases based on data received from the Earn and Redeem Partners. Earn and Redeem Partners will be expected to submit such data to Irving or its designated agent promptly after the Qualifying Purchase and redemption of any Discounts, but Irving is not responsible for any failure to do so. Earned Rewards, “Earned Value” and Discount credits have no cash or other monetary value. Discounts may not be redeemed until actually credited to and reflected in your Irving Rewards Account. Discounts are not transferable. You are solely responsible for checking your Irving Rewards Account regularly to ensure that all earned Discounts are properly credited. If you dispute the calculation of your Discounts or your Irving Rewards Account balance, you must notify Irving in writing at the address below within thirty (30) days of the date of posting of the disputed transaction to your Account Summary. Otherwise, the Account Summary will be deemed to be correct and binding on you. Irving’s decision in resolving any such dispute will be final and binding. If you disagree with Irving’s determination, your sole remedy is to withdraw from the Irving Rewards Program. “Qualifying Purchase” means a purchase made in accordance with the Irving Rewards Program terms and conditions, and any individual program terms, for which a Discount may be earned and includes (1) a Fuel purchase from a participating Fuel Seller after first swiping an Irving Rewards Card through the Fuel seller’s POS system; (2) an in-store purchase from a participating Fuel Seller after first swiping an Irving Rewards Card through the Fuel Seller’s POS system (excluding certain items, such as alcohol, tobacco, lottery, postage, money orders, gift cards and pre-paid cards, licenses, propane, car wash, municipal trash/recycling bags, and other items as may be designated by Irving or restricted by state law); (3) a Fuel purchase from a participating Fuel Seller paid by way of Irving Debit Pay (ACH debit) using a registered Irving Rewards Card linked to a bank account; and (4) home heating fuel purchases from Irving Energy or AE Robinson Oil by Irving Energy or AE Robinson customers who have registered their Irving Rewards Cards and linked their Energy account to their Irving Rewards account. (Only direct purchases of home heating fuel from Irving Energy and AE Robinson are eligible. Product credits, transfers, or adjustments are not eligible or credited as Qualifying Purchases). “Use Period” means the period in which Discounts may be redeemed and continues until such time as Irving modifies, amends, or terminates the redemption period for any Discount or discontinues the Irving Rewards Program. Irving Fuel Purchases: Every time you purchase Fuel from a participating Fuel Seller after first swiping your Irving Rewards Card through the participating Fuel Seller’s POS system, your Irving Rewards Account will accrue value equal to the number of gallons of Fuel you purchase (up to a maximum of Thirty (30) gallons in any one purchase transaction) (“Irving Fuel Earned Value”). Every time your Irving Fuel Earned Value reaches Fifty (50) Gallons you will earn a %%VALUE%%.10 per gallon reward available on your next single purchase of Fuel (up to a maximum of Twenty (20) Gallons) from a participating Fuel Seller when using your Irving Rewards Card, (the “Irving Fuel Discount”). Rewards are generally available for use in approximately 30 minutes after the required Irving Fuel Earned Value threshold is reached. If your Irving Fuel Earned Value exceeds the 50 gallon threshold, the remained will be applied to your next fuel savings reward. Irving Fuel Discounts will be available for use for the remainder of the month in which the reward is earned, plus an additional 60 days thereafter, at which point they will expire. All rewards expire at the end of the Use Period. In-Store Purchases: Every time you make a qualifying in-store purchase from a participating Fuel Seller after first swiping your Irving Rewards Card through the participating Fuel Seller’s POS system, your Irving Rewards Account will accrue value equal to the dollar amount of your purchase for qualifying items (certain items, such as alcohol, tobacco, lottery, postage, money orders, gift cards and pre-paid cards, licenses, propane, car wash, municipal trash/recycling bags, and other items as may be designated by Irving or restricted by state law do not qualify and are excluded) (the “In-Store Earned Value”). Every time your In-Store Earned Value reaches Fifty Dollars ($50) of In-Store Qualifying Purchases using your Irving Rewards Card you will earn a %%VALUE%%.05 per gallon reward available on your next single purchase of Fuel (up to a maximum of Twenty (20) Gallons) from a participating Fuel Seller when using your Irving Rewards Card (the “In-Store Fuel Discount”). Rewards are generally available for use in approximately 30 minutes after the required In-Store Fuel Earned Value threshold is reached. If your In-Store Earned Value exceeds the $50 threshold, the remained will be applied to your next fuel savings reward. In-Store Fuel Discounts will be available for use for the remainder of the month in which the reward is earned, plus an additional 60 days thereafter, at which point they will expire. All rewards expire at the end of the Use Period. Irving Debit Pay: You may link your registered Irving Rewards Card to your bank account. Once linked, your Irving Rewards Card may be used to pay for Fuel purchases as an ACH debit payment from your linked bank account. Every time you purchase Fuel from a participating Fuel Seller using your Irving Rewards Card as an Irving Debit Pay payment method, you will automatically receive a Discount of %%VALUE%%.06 on every gallon purchased in that single Fuel purchase transaction (the “Irving Debit Pay Discount”). There is no carry forward of an Irving Debit Pay Discount. Irving Debit Pay Introductory Offer: For the first 90 days after you link your registered Irving Rewards Card to your bank account, you will be eligible for an additional %%VALUE%%.04 rebate on every gallon of Fuel purchased using your Irving Rewards Card as an Irving Debit Pay payment method. The %%VALUE%%.04 per gallon Irving Debit Pay Introductory Offer rebate will be reflected as an adjustment to the charge for your qualifying Fuel purchase when your linked bank account is debited and will not be available as an automatic Discount at the pump. The Irving Debit Pay ACH debit payment feature is available only at participating Fuel Sellers with compatible POS systems. Information regarding the Irving Debit Pay payment feature may be found at https://secure.paymentcard.com/faq1.php Third party terms and conditions may apply. Irving Energy Home Heating Fuel Purchases: Irving Energy home heat customers in Maine, New Hampshire and Vermont may link their registered Irving Rewards Card to their Irving Energy home heat account. For every gallon of home heating fuel delivered to your residence from Irving Energy on your linked Irving Rewards Account, your Irving Rewards Account will accrue value equal to the number of gallons of heating fuel delivered (“Irving Energy Earned Value”). (Residential accounts only. Only direct purchases of home heating fuel from Irving Energy are eligible. Product credits, transfers, or adjustments are not eligible or credited as Qualifying Purchases toward Irving Energy Earned Value. Credit toward Irving Energy Earned value is earned on delivery). Every time your Irving Energy Earned Value reaches fifty (50) gallons on a home heating fuel purchase from Irving Energy, you will earn a discount of %%VALUE%%.05 per gallon, available on your next single purchase of Fuel (up to a maximum of Twenty (20) Gallons), from a participating Fuel Seller when using your Irving Rewards Card after the required Irving Energy Earned Value is credited to your Irving Rewards Account (the “Irving Energy Discount”). It may take approximately one week after delivery for Irving Energy Qualifying Purchases to be reflected in your Irving Rewards Account. An Irving Energy Discount of %%VALUE%%.05 is earned for each fifty gallons of home heating fuel delivered. By way of example, a delivery of 100 gallons of home heating fuel from Irving Energy on a linked account will yield an Irving Energy Discount of %%VALUE%%.10 on your next single Fuel purchase using your Irving Rewards Card after the required Irving Energy Earned Value is reflected in your Irving Rewards Account, and a delivery of 150 gallons of home heating fuel from Irving Energy will yield an Irving Energy Discount of %%VALUE%%.15 on your next single Fuel purchase using your Irving Rewards Card after the required Irving Energy Earned Value is reflected in your Irving Rewards Account. There is no pro-rata reward for partial increments. Irving Energy Discounts will be available for use for the remainder of the month in which the reward was earned and credited to your account, plus an additional 60 days thereafter, at which point they will expire. All rewards expire at the end of the Use Period. AE Robinson Home Heating Fuel Purchases: AE Robinson home heat customers in Maine may link their registered Irving Rewards Card to their AE Robinson home heat account. For every gallon of home heating fuel delivered from AE Robinson on a linked Irving Rewards Account, your Irving Rewards Account will accrue value equal to the number of gallons of heating fuel you purchase (“AE Robinson Earned Value”). (Residential accounts only. Only direct purchases of home heating fuel from AE Robinson are eligible. Product credits, transfers, or adjustments are not eligible or credited as Qualifying Purchases toward AE Robinson Earned Value. Credit toward AE Robinson Earned value is earned on delivery). Every time your AE Robinson Earned Value reaches fifty (50) gallons on a home heating fuel delivery from AE Robinson, you will earn a discount of %%VALUE%%.05 per gallon, available on your next single purchase of Fuel (up to a maximum of Twenty (20) Gallons), from a participating Fuel Seller when using your Irving Rewards Card after the required AE Robinson Earned Value is credited to your Irving Rewards Account (the “AE Robinson Discount”). It may take approximately one week after delivery for AE Robinson Qualifying Purchases to be reflected in your Irving Rewards Account. An AE Robinson Discount of %%VALUE%%.05 is earned for each fifty gallons of home heating fuel delivered. By way of example, a delivery of 100 gallons of home heating fuel from AE Robinson on a linked account will yield an AE Robinson Discount of %%VALUE%%.10 on your next single Fuel purchase using your Irving Rewards Card after the required AE Robinson Earned Value is reflected in your Irving Rewards Account, and a delivery of 150 gallons of home heating fuel from AE Robinson will yield an AE Robinson Discount of %%VALUE%%.15 on your next single Fuel purchase using your Irving Rewards Card after the required AE Robinson Earned Value is reflected in your Irving Rewards Account. There is no pro-rata reward for partial increments. AE Robinson Discounts will be available for use for the remainder of the month in which the reward was earned and credited to your account, plus an additional 60 days thereafter, at which point they will expire. All rewards expire at the end of the Use Period. The method of calculating and/or using any Discount may be modified by Irving, without prior notice, and Irving may also modify, without prior notice, which purchases will be Qualifying Purchases leading to the creation of Discounts. The terms and conditions of any promotional program may be changed without prior notice from Irving. Irving may impose additional restrictions, without prior notice, pertaining to the extent or duration of any Discount, including any expiration date applicable to a Discount. To the extent any such restrictions cause the modification or termination of a Discount, it may be reflected in your Account Summary, however Irving will not be responsible for any failure to do so, and no compensation will be owed to you due to any such modification or termination. Irving reserves the right to correct any typographical errors or omissions in these Terms and Conditions and Irving shall have no liability or ongoing obligation to any Participant as a result of any such error or omission. If an Earn and Redeem Partner ceases to participate in the Irving Rewards Program, Irving will cease recording Discounts associated with the withdrawing Earn and Redeem Partner. Discounts may be applied to Fuel purchases up to the Fuel Seller’s posted price per gallon of the applicable Fuel and up to the gallon limitation as may be imposed by Irving. Discounts are non-transferable and may not be redeemed for cash or in-store merchandise. The Fuel Seller may impose restrictions on combining Discounts with other Fuel Seller promotional programs. Any Fuel Seller’s restrictions affecting the Discounts may be changed without prior notice from Irving. To the extent any such restrictions cause the modification or termination of a Discount, it may be reflected in your Account Summary, however, Irving will not be responsible for any failure to do so, and no compensation will be owed to you due to any such modification or termination. If a Fuel Seller ceases to participate in the Irving Rewards Program, Discounts will no longer be useable in connection with Fuel purchases from such Fuel Seller. The Irving Rewards Program may be modified or cancelled at any time, without prior notice, and all Discounts shall thereupon be null and void and no compensation shall be owed to you for unexpended Discounts. If your Irving Rewards Card is lost or stolen, notify Irving immediately at 1-855-774-7975 to deactivate access to your Discounts. Deactivation may take up to seven (7) days after you request it. Until deactivation, anyone may use your Irving Rewards Card to access your Discounts, and Discounts expended by unauthorized persons will not be re-credited to your Irving Rewards Account. If you have linked your Irving Rewards Card to your bank account, you should notify your financial institution immediately of a lost or stolen card. Irving is not responsible for lost or stolen Irving Rewards Cards. You may close your Irving Rewards Account at any time by notifying Irving at Irving Rewards, 190 Commerce Way, Portsmouth, New Hampshire 03801 or by calling 1-855-774-7975. 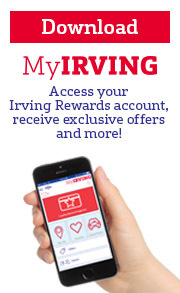 Irving may close any Irving Rewards Account at any time without notice for violation of these terms and conditions. Upon closure of a Participant’s Irving Rewards Account, any Discounts shown by such Participant’s Account Summary will be terminated without compensation to Participant. Irving shall have no liability for the accuracy of any data reported to Irving Rewards by any Earn and Redeem Partner or any other third party, nor for any inaccuracy, error, defect, or malfunction of the Irving Rewards Website or information contained therein, any Participant inability to access the Irving Rewards Website or information contained therein, any misallocation or misuse of Discounts, nor any unauthorized access to the Irving Rewards Website and/or misappropriation of information contained therein by any third party. The information contained on the Irving Rewards Website including the Account Summary may contain technical inaccuracies or typographical or computational errors and Irving Rewards shall have no liability for these errors, nor for any delays, loss or nonperformance caused by any matter beyond Irving’s reasonable control, including without limitation, electrical power disruption, computer software or hardware malfunctions, telephone, data, or internet service disruptions, or the acts or omissions of any Earn and Redeem Partner or any third party. You are granted a limited revocable license to use the Irving Rewards Website for purposes related to your participation in the Irving Rewards Program, but Irving cannot and does not guarantee continuous, uninterrupted or secure access to the Irving rewards Website. THE IRVING REWARDS WEBSITE AND IRVING REWARDS PROGRAM ARE PROVIDED “AS IS” WITHOUT ANY WARRANTY OF ANY KIND, EITHER EXPRESS OR IMPLIED, INCLUDING, BUT NOT LIMITED TO, ANY WARRANTIES OF MERCHANTABILITY OR FITNESS FOR A PARTICULAR PURPOSE. EXCEPT WHERE PROHIBITED BY LAW, IN NO EVENT SHALL IRVING BE LIABLE FOR ANY PUNITIVE, SPECIAL, EXEMPLARY OR CONSEQUENTIAL DAMAGES WHATSOEVER, NOR FOR ANY DAMAGES OF ANY KIND WHATSOEVER WHETHER DIRECT OR INDIRECT, INCLUDING BUT NOT LIMITED TO LOSS OF DATA OR ECONOMIC LOSS, WITHOUT REGARD TO THE FORM OF ANY ACTION (INCLUDING, BUT NOT LIMITED TO, CONTRACT OR TORT ACTION) ARISING OUT OF OR IN CONNECTION WITH ANY USE, DISPLAY OF OR RELIANCE ON INFORMATION CONTAINED IN OR NOT CONTAINED IN THE IRVING REWARDS WEBSITE. IRVING’S MAXIMUM LIABILITY FOR ANY CLAIM, WHETHER IN CONTRACT, TORT, OR OTHERWISE, SHALL BE LIMITED TO ONE HUNDRED DOLLARS ($100). You represent, as a condition to participating in the Irving Rewards Program, that you are an individual (and not a corporation, limited liability company, or partnership, etc.) at least eighteen (18) years old. You agree to comply with all of these Participant Terms and Conditions and all rules, regulations, terms and conditions relating to any Irving Rewards offer, as the same may be amended by Irving from time to time, and with all applicable laws and regulations. You agree to pay for all Fuel purchases and to pay for all Qualifying Purchases. You shall not transfer nor attempt to transfer any Discounts to any other person, nor use any Discounts to acquire Fuel for resale or for any purpose other than personal use. You will use the Irving Rewards Website solely for purposes of accessing your own Account Summary and managing your own participation in the Irving Rewards Program and will use your Irving Rewards Cards solely as contemplated by these Participant Terms and Conditions. You represent that you: (i) have and will use your actual identity when registering for and using the Irving Rewards Program and the Irving Rewards Website; (ii) have provided true, accurate, and complete information; and (iii) will maintain and promptly update all information to keep it true, accurate, current and complete. BY PARTICIPATING IN THE IRVING REWARDS PROGRAM, YOU RELEASE IRVING AND ITS AFFILIATES, EARN AND REDEEM PARTNERS AND THEIR RESPECTIVE OFFICERS, DIRECTORS, MEMBERS OR SHAREHOLDERS, EMPLOYEES AND AGENTS (THE “RELEASED PARTIES”) FROM AND AGAINST ALL CLAIMS OF INJURY, LOSS, DAMAGE OR HARM OF ANY KIND, INCLUDING CLAIMS OF NEGLIGENCE AGAINST THE RELEASED PARTIES, ARISING FROM OR RELATING TO YOUR PARTICIPATION IN THE PROGRAM. YOU AGREE TO INDEMNIFY, DEFEND AND HOLD HARMLESS THE RELEASED PARTIES FROM AND AGAINST ALL LIABILITY, LOSS, CLAIM AND EXPENSE, INCLUDING ATTORNEYS FEES, TO THE FULLEST EXTENT PERMITTED BY LAW, ARISING FROM OR RELATING TO YOUR VIOLATION OF LAW, VIOLATION OF THESE TERMS AND CONDITIONS OR ANY FALSE, INCOMPLETE OR MISLEADING REPRESENTATION OR STATEMENTS MADE BY YOU. THE FOREGOING INDEMNIFICATION AND DEFENSE OBLIGATIONS SHALL SURVIVE ANY CLOSURE OF YOUR IRVING REWARDS ACCOUNT. You agree that you have not, and you will not take any action intended to: (i) access data that is not intended for you; (ii) invade the privacy of, obtain the identity of, or obtain any personal information about any other user or Participant; (iii) probe, scan, or test the vulnerability of the Irving Rewards Website or circumvent security or authentication measures without proper authorization; (iv) attempt to interfere with any user or Participant or interfere with the business of Irving, Irving Energy or any participating Fuel Seller; or (v) send any unsolicited mail, including promotions and/or advertising of products and service. Unless otherwise noted, all intellectual property (including copyrights, trademarks, service marks, trade dress and patents) relating to the Irving Rewards Program and Website are owned, controlled or licensed by Irving or its affiliates. The compilation of all content in the Irving Rewards Website is the property of Irving or its affiliates. Unauthorized copying or use of any intellectual property is expressly prohibited. Irving may use third party trademarks of other entities on the Website. Such trademarks shall remain the intellectual property of their respective third party owners. Nothing herein shall be construed as granting by implication, estoppel, or otherwise, any license or right to use the Irving Rewards name, marks or trade dress, the Irving Rewards Website, or any information displayed or contained therein except as expressly permitted by these Participant Terms and Conditions or with the prior written permission of Irving or the third party that may own the intellectual property. Irving may provide hyperlinks to third party websites on the Irving Rewards Website. These third party sites may contain terms and conditions and privacy policies that differ from Irving’s. Irving is not responsible for the collection, use or disclosure of any personal information by any third party website and Irving expressly disclaims any and all liabilities related to such collection, use or disclosure. We welcome your comments, messages, ideas, suggestions and feedback (collectively “Comments”) concerning the Irving Rewards Program and Website. All Comments will become the property of Irving and your submission of any Comments shall constitute an assignment to Irving of all worldwide rights, title, and interest in all copyrights and intellectual property in the Comments. Irving will be entitled to use, reproduce, disclose, publish and distribute all Comments and related materials for any purpose whatsoever, without restriction and without any obligation to compensate you in any way. Comments may be sent to: Irving Rewards, 190 Commerce Way, Portsmouth, New Hampshire 03801. Irving has the right, but not the obligation, to monitor and edit or remove and comments or content. Irving undertakes no responsibility and assumes no liability for any content posted by you or any other third party. We may send you certain information that can include periodic statements of your Account and other information necessary for administration of the Irving Rewards Program; promotional communications which will inform you of special offers and products we believe would be of interest to you; and promotional communications from third parties that have a relationship with the Irving Rewards Program. As a Participant in the Irving Rewards Program, you consent to receive the information described above. If, at any time, you wish to no longer receive promotional communications relating to the Irving Rewards Program, you may opt out of the receipt of such promotional communications by clicking on the Unsubscribe link provided at the bottom of each e-mail or by contacting Irving Rewards, 190 Commerce Way, Portsmouth, New Hampshire 03801. Requests to be unsubscribed or to opt out of promotional communications will be processed promptly, however, you may be included in the selection for additional promotional communications for a short period of time after you make your request. We reserve the right to send out certain communications, including by email and/or regular mail, relating to membership information, and administrative messages that are considered part of your Irving Rewards Account, without offering you the opportunity to opt out of receiving them. Irving is not responsible and shall have no liability for any promotional or other communications sent to you by third parties. If any part of these Participant Terms and Conditions is determined to be invalid or unenforceable, such part will be treated as if it did not exist (or interpreted, if possible, in a manner as to be enforceable) and the remainder will continue in full force and effect. These Participant Terms and Conditions will be interpreted under the laws of the State of New Hampshire, exclusive of its conflicts of law rules. Any litigation arising from the subject matter of these Participant Terms and Conditions may only be brought in a court located in New Hampshire. Regardless of any statute or law to the contrary, any claim or cause of action arising out of or relating to the Irving Rewards Program or the Irving Rewards Website must be filed within one (1) year after such claim or cause of action arose, or be forever barred. These Participant Terms and Conditions, as amended from time to time, contain the entire agreement between Irving Rewards and Participant as to its subject matter, and can only be modified in writing by Irving Rewards. Participant may not assign any rights or benefits accruing to it by virtue of participation in the Irving Rewards Program.